Bond is back - with a bang. Daniel Craig's ultra-tough incarnation of agent 007 continues in this action-packed sequel to Casino Royale. 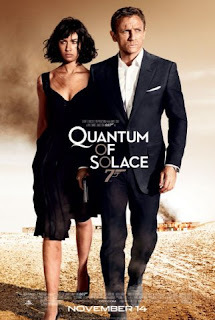 Solace compensates for Casino Royale's lack of good old stunt action but on the other hand sacrifices some intelligence. Overall, there is really not much to complain about when Bond is falling through windows, skydiving without a parachute, and ramming a speedboat into a yacht. This entry was posted on föstudagur, nóvember 21, 2008 at 11:07 e.h.. | You can skip to the end and leave a response.